Valedictorian Saransh Chopra and salutatorian Michael Higgins put competitive academics aside when it comes to their friendship. Photo by Zane Clark: Lenape High School Class of 2017 valedictorian Saransh Chopra, left, stands with this year’s salutatorian Michael Higgins. In addition to ranking at the top of their class, the two have been good friends since elementary school. 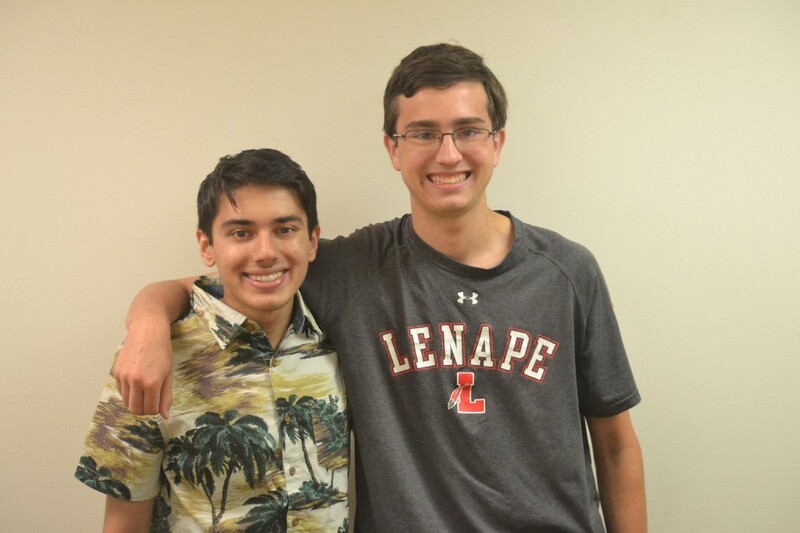 Lenape High School’s valedictorian and salutatorian have more in common than just good grades this year– they’re good friends, too. Michael Higgins, this year’s salutatorian, first met Saransh Chopra, this year’s valedictorian, when Chopra moved to Mt. Laurel in the fourth grade and started attending Springville Elementary. Although the two weren’t in the same class, Higgins said he’d heard there was a new kid in school, and when Higgins and Chopra met, they were fast friends. The two played baseball together, went swimming together in Higgins’ pool during the summer and joined many of the same academic clubs and teams as they entered high school. Now years later, both young men have achieved a weighted 6.0 GPA at the end of their high school career, and they finish their time at Lenape with nothing but the school’s highest-level honor and AP classes in their schedule throughout each of their four years. Having each taken 14 AP classes, Higgins and Chopra said they believe that was enough of a determining factor to separate them into a category of their own from other students in the running for this year’s valedictorian and salutatorian. Yet beyond that distinction, even they aren’t exactly sure what factored into the final decision. According to Chopra and Higgins, there was no single moment where the two sat down together and decided they wanted to become valedictorian and salutatorian together. Rather, they were each simply driven toward academic success on separate, but parallel journeys. “I’m really glad that we’re friends because I have friends in others schools that say there’s so much competition and animosity, and I definitely feel there was a lot less of that, not just between us, but in our grade,” Chopra said. Higgins said achieving the distinction of salutatorian means knowing he was able to set a goal for himself and that he always worked to achieve that goal. “It was more about a sense of personal accomplishment, as opposed to showing everybody else that I was intelligent. It was never really a pride thing for me,” Higgins said. For Chopra, becoming valedictorian is just another part of the lessons his parents have stressed to him about the importance of academic success in his life. Now Lenape’s valedictorian and salutatorian prepare for the next phase of their lives. Chopra finds himself headed to Carnegie Mellon University in Pittsburgh, where he hopes to major in computational finance, and Higgins said he’ll be at Rutgers University-New Brunswick, majoring in mechanical engineering. When asked to speak about his longtime friend, Chopra laughed when he recalled how the two have had so much in common throughout their friendship, but also have differences as well. Higgins said despite the competition inherent in high school academics, his friendship with Chopra has been preserved and the two have always been able to put aside their competitive spirits despite the competition sometimes inherit in high school academics.